On the border between the Hopi and Navajo Indian Reservations in the vast desert of northeast Arizona, Coal Mine Canyon is a long way from any famous attraction and is not signposted in any way yet has become quite well known because of the amazingly colorful formations that line the upper end of the ravine. 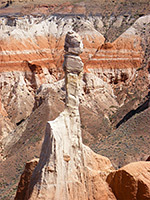 The canyon is one of many remote, little-visited sites in the Southwest where the main interest comes from the detail of the rock - the colors, forms and textures of the eroded sandstone - rather than the large scale appeal of such grand places as Zion and Monument Valley; others include Bisti Wilderness, Coyote Buttes and Paria Rimrocks. There must be dozens more similar places as yet unpublicized, hidden away in the high desert plains of this part of Arizona - Coal Mine Canyon sits at the edge of the 120 mile wide Painted Desert, a sparsely settled region without many roads but covered by extensive areas of exposed, weathered rock. 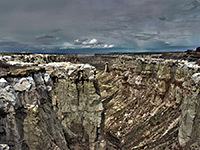 The canyon is accessed from highway 264 between Tuba City and Old Oraibi - a little used road that forks south off the much busier US 160, winds across the wide valley of Moenkopi Wash then climbs to the top of a flat, featureless, grassy plateau (Coal Mine Mesa), reminiscent of the endless Llano Estacado of New Mexico and the Texas Panhandle. Mesa and canyon are named on account of the thin, low grade deposits of coal that are found scattered across the area, and are prominently visible in parts of the upper canyon. Occasional dwellings dot the landscape, at the end of sandy side tracks, but otherwise the land is unchanging, the road straight and empty. Tuba City has a small selection of lodging, 16 miles from the canyon. 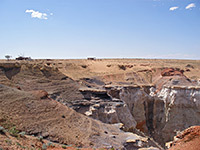 Coal Mine Canyon is first sighted about 15 miles from Tuba City, and the usual viewing area is reached by a half mile drive along a dirt track - narrow and bumpy but fine for all vehicles - that leaves highway 264 between mileposts 336 and 337. This track leads to a new-looking 2 storey residence, but the canyon rim is a little way to the right, at the end of a side track that passes an isolated windmill and water tank, ending at a parking area next to a rather forlorn picnic spot consisting of a few concrete tables & chairs surrounded by bare red earth within a fenced enclosure. The place has quite a lot of litter, but the views to the north are the reason why people visit, as ahead the flat land falls away abruptly and steeply, down several hundred feet to the floor of quite a narrow canyon 4 miles long, the sides of which are composed of an unbelievable array of intricately eroded spires, hoodoos, gullies, fins and cliffs, of every color imaginable. 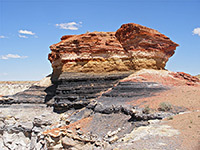 The rocks around the rim are soft and crumbly (various thin layers of the Dakota sandstone group), lying on top of thicker bands of the Entrada Formation, with red, white, black and gray the main colors. The top strata have wildly contrasting tints in quick succession - red then white then orange then black, over a vertical distance of just a few feet. The bright red layers are the result of coloration of shale due to partial burning of the underlying coal. The erosional forms are generally similar to many other Southwest parks (such as Bryce Canyon, Cedar Breaks, Cathedral Gorge and Red Rock Canyon), but none of these can match the variety of both color and form on show at Coal Mine Canyon. Although there is no obvious path into the canyon, faint trails lead east and west along the rim, and towards some of the ridges that project outwards; there are two main promontories, each gradually narrowing and ending at isolated pinnacles with vertical drop-offs all around. Footprints show wherever a visitor has strayed from the paths, as the soils are delicate and easily disturbed, though the amount of land that can be walked upon is relatively limited as the slopes fall away steeply in most directions. The formations appear similar for a mile or so along each side of the ravine, with the south rim having the best features. Trails along the canyon floor can be seen from the rim but a route down is not evident; there is however a faint path descending the steep slopes starting a little way east of the picnic area. In the distance to the north are smooth, pastel-colored badlands at the mouth of the canyon, representing a much more advanced cycle of erosion of the same shales and sandstones. This rolling landscape extends a long way, past the ends of various other tributaries of the gorge and of nearby Ha Ho No Geh Canyon and Blue Canyon, all of which have similar formations and are even less visited. 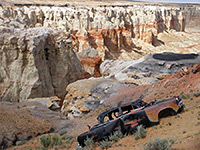 Coal Mine Canyon is certainly a remote-feeling place; windswept, lonely, with evocative debris like the shell of a 1950s car at the head of one ravine, and several long-abandoned buildings on the rim. Similar eroded scenery is found in various places in this part of the Navajo Reservation, such as around Moenkopi Wash and along Ward Terrace, including some that the locals apparently do not want publicized. 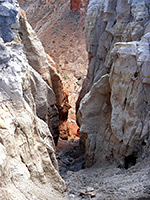 As well as being excellent for hiking and photography, Coal Mine Canyon would make an atmospheric place to camp, though a Navajo permit would probably be needed for this.